Founded by Laurence Equilbey for the purpose of performing the major works of the a cappella repertoire and engaging with contemporary creation, accentus is today an ensemble of 32 professional singers which appears at the leading French and international festivals. 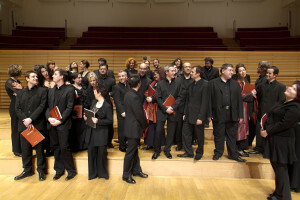 The choir collaborates regularly with prestigious conductors and orchestras (Pierre Boulez, Jonathan Nott, Christoph Eschenbach, Orchestre de Paris, Ensemble Intercontemporain, Orchestre de l’Opéra de Rouen/Haute Normandie, Concerto Köln, Akademie für Alte Musik). It has participated in a variety of operatic productions ranging from contemporary premieres (Pascal Dusapin’s Perelà, uomo di fumo and Matthias Pintscher’s L’Espace dernier at the Paris Opéra) to the standard repertoire (Rossini’s Il barbiere di Siviglia at the Aix-en-Provence Festival). The ensemble is also privileged partner of the Cité de la Musique in Paris, and enjoys an ongoing residence at the Opéra de Rouen/Haute Normandie, structured around the axes of a cappella concerts and programmes for choir and orchestra. Critically acclaimed ever since its first recording, accentus was awarded the Liliane Bettencourt Prize of the Académie des Beaux-Arts in 1995. Each of its CDs has received numerous prizes from the music press, and its recording of Transcriptions, which has sold more than 100,000 copies, was a Grammy Award nominee in 2004, and received a Disque d’or in January 2008. Its Schoenberg recording with the Ensemble Intercontemporain (2005) received a Midem Classical Award in 2006. Haydn’s Seven Last Words of Christ on the Cross with the Akademie für Alte Musik Berlin (2006), is already considered a benchmark version. The choir’s most recent releases were a second volume of Transcriptions (2006) and a recording of Liszt’s Via Crucis with Brigitte Engerer (2007). accentus received the Grand Prix Radio Classique de la Découverte in 2001 and was voted Ensemble of the Year in the Victoires de la Musique Classique in 2002, 2005 and 2008. It is the first ensemble to use the electronic tuning system e-tuner.